Dutch and Flemish masterpieces by some of the foremost artists of the 17th century are on display at Chester’s Grosvenor Museum this summer. A pair of portraits by Rembrandt and two paintings by David Teniers the Younger, generously lent from the Grosvenor family collection, will be on display between 27 June and 23 September. Rembrandt van Rijn (1606-1669) was the best known and most influential Dutch artist of the 17th century and one of the supreme geniuses in the history of art. Born in Leiden, and trained as a painter there and in Amsterdam, he subsequently worked in his home town from about 1624. In 1631/2 Rembrandt moved to Amsterdam and rapidly became the city’s leading portraitist for the next decade. His portraits from this period, often in pairs, employ a brilliant technique and convey a sense of physical presence. ‘A Man with a Hawk’ and ‘A Lady with a Fan’, painted in 1643, are highly characteristic of Rembrandt’s art at this time. His business declined after the death of his wife Saskia in 1642, but his later works are deeper in emotional content and psychological penetration. David Teniers the Younger (1610-1690), who worked in Antwerp and Brussels as Court Painter to the Governor of the Southern Netherlands, is best known for his unidealised scenes of peasant life. ‘Saying Grace before a Meal’ depicts a well-off farming family in a well-equipped interior, presenting an image of modest rural wealth and celebrating the virtues of the peasantry, on whom the economic welfare of the people depended. ‘Interior of a Tavern’ shows peasants drinking and smoking. Although denounced as an evil by both Church and State, smoking was very popular at all levels of society, and the picture offers a sympathetic image of camaraderie rather than a moralising one of condemnation. These paintings are part of a programme of loans to the museum from the Grosvenor family collection, which belongs to the Grosvenor Estate Trustees, and was mostly acquired by the 1st and 2nd Earls Grosvenor in the late 18th and early 19th centuries. 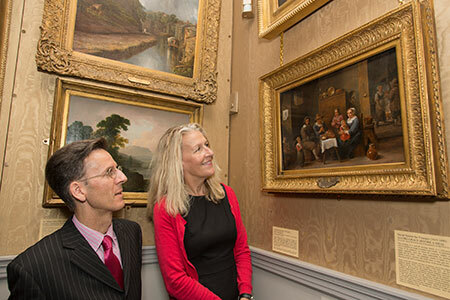 Councillor Louise Gittins, Cheshire West and Chester Council’s Cabinet Member for Communities and Wellbeing, said: “We are grateful to Her Grace and the Trustees of the Grosvenor Estate for the loan of these wonderful paintings, which will enable them to be seen and enjoyed by the museum’s many visitors this summer. The Grosvenor Museum is open Monday – Saturday 10.30am to 5pm and Sunday 1pm to 4pm, admission free, donations welcome.